With my continual training, I never truly reached the 13.1 miles that make up the half marathon due to a blizzard that hit the northeast close to the race, I went to Orlando, Florida with my running gear and high hopes. The first step was to visit the ESPN Wide World of Sports pavilion to check in for the race, pick up my packet and visit the race expo to see the different running related merchants pedaling their wares. After spending time viewing the assorted merchandise, it was time to head back to the hotel for an early bedtime. The half marathon began with fireworks at 5:30am and groups were released in 5 minute intervals. Since I had no prior recorded times, I was in the last group, known as Corral H, which started almost an hour later. In the predawn 40 degree weather, any warming up done in our group was wasted. Once we began, we moved en masse on to the roads outside Epcot, where it became an issue of dodging and weaving through the slower runners to find a comfortable pace. To me the most interesting thing during the first mile or two was the people doffing their warm up clothes and tossing them to the side of the road as we ran, the grass littered with garments as we traversed the course. The race began at Epcot center and moved along the road that led to the hotels. Passing by the Continental, Grand Floridian and other hotels became fatiguing, until Cinderella’s Castle loomed high above us and we turned into the backstage area that Disney World guests normally don’t have access to. We came out from there onto Main Street USA, where we were cheered on by cast members as we ran towards the castle. A turn led us into Tomorrowland followed by Liberty Square and Frontierland before turning back towards and through the middle of the castle and leading us back into the backstage area, which returned us out to the road and back towards Epcot, where we we made a loop around the Christmas tree and the home stretch where onlookers cheered on as we passed the finish line. As with everything Disney, it was well organized and had a very polished feel. The Disney workers all over were cheering on the runners and rooting us on as we passed. They even had assorted characters out for photo opportunities for those runners who were more interested in the Disney experience than the actual run itself. From princesses to Jack Sparrow to Donald and Goofy, a myriad of opportunities to see your favorite Disney characters on the path were available. For my first half marathon, my goal time was to do it under two hours, based on my training times. The official time for my run was 2:22:30, according to the D-Tag on my sneaker. While I am very proud of my time, it just gives me a goal to try for next time. According to my Nike+, my run was 16.94 miles, but I’m guessing the difference is the 13.1 is measures as a direct line while I was running around people and dodging as I ran. The Nike+ puts my pace at 8:27, but doing the math on my official time based on 13.1 miles puts my pace at 10:53, which is far slower than I have run any of my previous races, I attribute to the need to dodge slower people and the tight roads in the Magic Kingdom that were not made for large groups to run through. With the success of this run, I need several days to recuperate before training for my next. 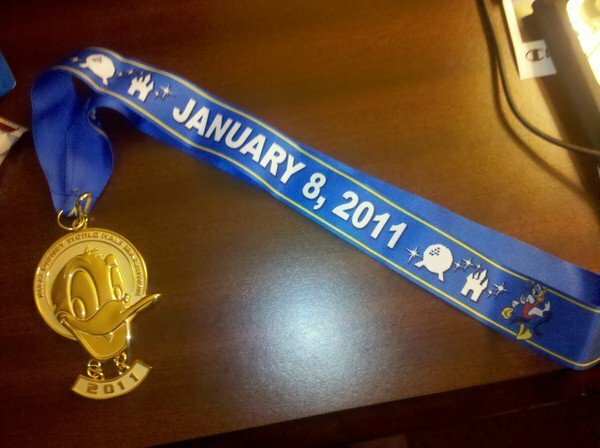 I am currently planning to run the Disney Land Half Marathon to complete the Coast to Coast Marathon, plus I look forward to running even more races this year to lead up to bigger and better.